Click here to make a donation today, Thank you! 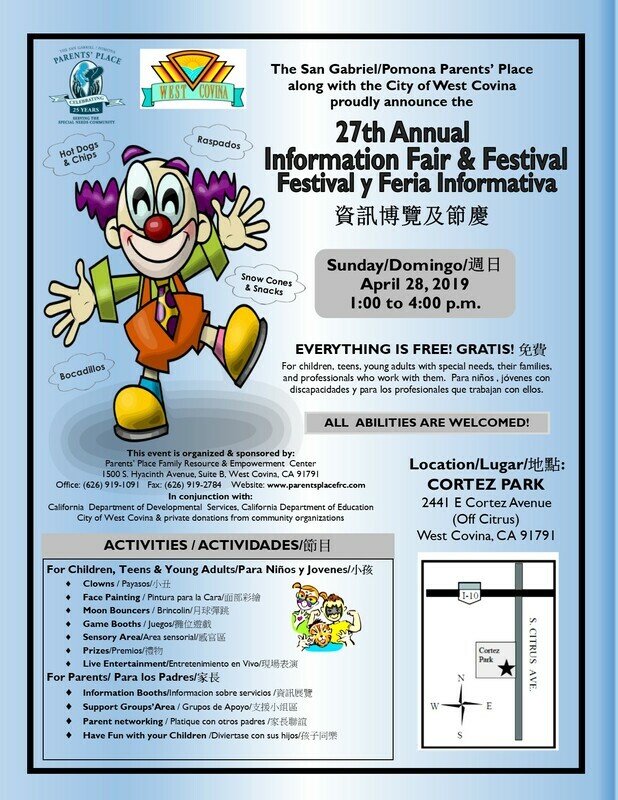 1 p.m. -4 p.m., at Cortez Park in West Covina. Many of you have participated in the past and we certainly hope you will be able to join us again this year. Our Info Fair is dedicated to children with special needs, their families, and the professionals who work with them. This special occasion allows families that have children with special needs to come together, in an open and friendly environment, to enjoy a lively festival and to find out about the over 100 community resources available to them. Last year, over 3,000 people attended the fair. The Fair would not have been such a tremendous success without the generous financial support from the community as well as the many volunteers who donated their time and energy. ​Below you'll find the forms needed to fill out for participants, vendors and volunteers. Vendors, should you submit your forms online Gloria Zuniga will send you an email/call verifying that she received your table application. If you do not receive an email/call within 2 business days email gloria.z@parentsplacefrc.com or call 626.919.1091. Last day to submit your form is April 13th. If you have any questions contact Gloria Zuniga; you may also speak to Elena Sanchez, Parents' Place Director. Volunteers, should you submit your forms online, Ms. L. will send you an email verifying that she received your table application. If you do not receive an email within 2 business days, email Ms. L at Tavia.L@parentsplacefrc.com or call 626.919.1091. You must submit an application and hold harmless agreement. Last day to submit your form is April 8th.